After some 35 years of filming exotic wildlife in remote corners of planet Earth, Wolfgang Bayer has turned the camera on himself. He is producing Wolf 's World, a feature length assessment of what the future holds for the bears, butterflies, manta rays, bats and the other living things he has recorded for posterity. He says that the mass killings of animals that was commonplace 20 to 30 years ago has lessened because the public has become much more conscious of the issue. At the same time, their habitats are being destroyed, leaving them no place to roam. The 35 mm film features Bayer, his wife and collaborator, Candy, and their two children, Tristan and Malaika, behind the scenes during travels to wildlife habitats ranging from Yellowstone to Greenland, from Kenya to Micronesia. Wolf's World is the culmination of a long time dream for Bayer. He calls it "a last film and testament." Bayer launched the project, which was planned for years, in the wake of a near-fatal heart attack on March 10, 1998. He considers that experience a warning that "dreams deferred too long are likely to go unrealized." Bayer has subsequently recorded more than 200,000 feet of film. He didn't want a distributor to tell him how to shoot and cut Wolf 's World, so Bayer funded the ambitious project himself with revenues from the sale of his film library to Discovery Channels in 1995. He had more than a million feet of outtakes. "The Ektachrome film I shot 30 years ago was in very good shape," Bayer says. Bayer was born and raised in Germany, where he studied engineering. He became an avid filmmaker after his father bought him an old film camera. His career had an improbable beginning. He visited Yellowstone National Park in 1964, and shot a 30-minute film that he sold to Bill Burrud for $250. It aired on Wild Kingdom. It was the first step on a lifelong journey. He worked with Burrud until the early 1970s, and then became an independent filmmaker. Bayer has compiled more than 200 TV film credits, and recorded more than two million feet of 16 mm and Super 16 film. Bayer settled in Jackson Hole, Wyoming, but the world was his domain. He was cast in the role of producer/cinematographer, and Candy recorded film sound during the early years. They sometimes spent months in Africa or in a South American jungle, patiently recording film of bats, flamingos and army ants. Bayer credits Burrud with advising him to keep the rights to his outtakes. 'After we sold the library, I bought an Arri 434 and an Arri BL-4, plus a couple Arri 2C cameras, and have been shooting everything in 35 mm format ever since," he says. For this project of his dreams, Bayer says he wanted impeccable image quality, and he wanted Wolf 's World to be a "future-proof' film for the ages. He also decided that he would shoot Wolf's World in widescreen format (2.4:1 aspect ratio), because "that is what nature deserves." The initial footage for Wolf's World was filmed in anamorphic format, but after a while he switched to the Super 35, because it gave him more flexibility in the choice of faster and more compact spherical lenses. Bayer selected some 15 places to include in the film, including polar bears in Canada, Komodo Dragons in Africa and Monarch butterflies in Mexico. At certain times, there were a 100 million butterflies in trees on top of a 10,000-foot-high mountain top. In addition to footage of the animals in their natural habitats, there are behind-the-scenes shots of Bayer and his family discussing their feelings about the animals and places they are re-visiting. "It's awkward, because I can't look at the camera without wondering how he's framing me and exposing the film, and whether it's a shot I would take," he says. "We are doing something I've never done on a nature film. We are using reflectors and sometimes little HMI lights for dramatic affect. It's pretty easy to use reflectors when you are under a forest canopy in the shadows, but it was more difficult in the Borneo rainforest, where we were filming orangutans swinging in the trees. It was very contrasty, and it was too difficult to light an area like that while the animals were swinging from tree to tree." When he began his career, Bayer recalls he typically recorded images on Kodak Ektachrome film that was rated for an exposure index of 12. He remembers when he thought a new Ektachrome film rated for E.I. 25 was high-speed. He is shooting Wolf 's World with two daylight-balanced films, Kodak 5245, rated for an exposure index of 50, and Kodak Vision 5246, with an E.I. of 250. "I'm using different grad filters to manipulate and interpret the quality of images," he says. "Since this isn't a pure documentary I feel we can be more expressive." A certain amount of faith is required, since there is no such a thing as dailies when you are shooting film in Indonesia, Micronesia and Malaysia. "When we finished at a remote location, we'd ship all of the exposed film to the lab, which would make video dailies," he laments. "By then, we were someplace else, so it was too late to fix anything, if we had a problem with the film. It was totally reliable even in the hottest, more humid places. Once we discovered a problem with a new lens, and we lost quite a bit of footage, but our coverage was adequate." The decision to shoot in 35 mm format imposed some practical limits. The lenses are bulkier and heavier, so shooting in real cinema vérité style with a camera on your shoulder, chasing after animals, was much less practical. Bayer says he did much more planning and staging, and even rehearsed how to approach shooting certain sequences. After all of these years, we asked if he has developed a special affinity for any types of animals? "I love army ants as much as I love elephants and flamingos," he responds, "but orangutans are one of my favorites, because they are so much like us." Bayer says that the film has been converted to Beta format tape in letterbox format for off-line editing. He is working on a rough cut of a 50-minute sequence of footage taken at Palau's Jellyfish Lake that consists of images, some introductory narration and voice-overs of the family talking during the conversational sequences. However, Bayer says that he considers Wolf 's World a work-in-progress. At this point, he hasn't set a deadline for finishing. He anticipates that the evolution of HDTV will provide a natural outlet for broadcast or home video release, and is also planning for a cinema release someday, maybe in Europe. "I've never regretted my decision to spend my life doing this work," he says. "I have enjoyed every moment. This film is the sum of what I have learned. My hope is that the people who see Wolf's World will come away with a deeper feeling and appreciation for the animals and nature. It isn't another film about animal behavior. It is about the wonders of the world told with images in a way that words can't describe." 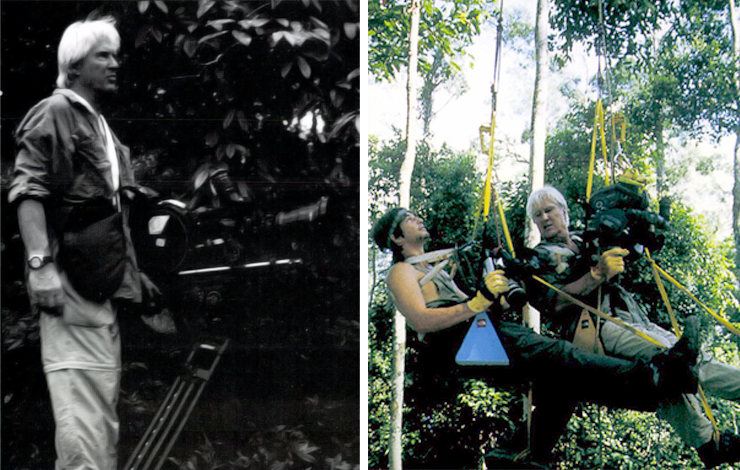 Bob Fisher has been writing about cinematography and other industry issues for over 25 years.